During the last OVC Hack Labs day in NYC (2010 OVC), one of the fun projects we worked on was an education application that allows quick remixing of short video ads. Each Child in the United States is subjected to an average of 25,000 TV commercials every year. Embedded in those advertisements are a regressive and stereotypical set of social values about expected gender roles for boys and girls. So how can kids hope to push back against that billion dollar marketing machine? 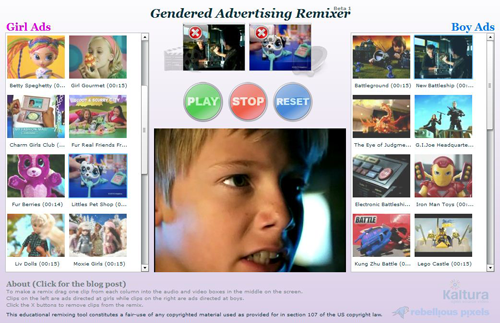 This simple remixing tool provides an easy way to re-combine audio from ads directed at boys with video from ads directed at girls (and vice versa) to create hilarious and insightful new mash-ups. The project’s goal is to help empower youth of all genders to better understand, deconstruct and creatively re-frame the highly gendered messages emanating from their television sets. Jonathan and I met during the OVC Hack Labs day, where he shared his idea and told me about a workshop he did: Reel Grrls Workshop: Gendered Ads Remixed. I took the challenge, and after a couple hours of planning and coding (and mostly beer drinking), the application was ready and live. Last night, in preparation for Jonathan’s participation at the Digital Media and Learning Conference, we polished bits of the design and made it live –Gendered Advertising Remixer – Beta 1. The application utilizes the Kaltura Flex Collaborative Video Framework, the same code library used behind the scenes to create the Kaltura Online Video Editors (KSE and KAE). This is the “mixing magic” that combines the audio and video streams of the two video ads dragged to the center. Utilizing Adobe Flex framework 4.5, made it super easy to put the UI parts together, specifically extending Flex’s TileList and other layout components. Right click > view source, on the Flash App to see the source code, and learn more, most should be pretty straight forward for Flex developers out there. Check out Jonathan’s “The Politics of User Generated Content” session at the DML Conference, March 5th.